Send your meeting guests a country specific toll-free or local access number. This permits easy access to your meeting from their country. All participants dial-in, enter a PIN and talk together internationally. The complete list of 150+ international access numbers is sent to you upon account activation. To join your call, your attendees dial a toll free or local access number that corresponds to their geographical location. They are then prompted for a passcode. For the chairperson or attendees that want to use their smartphone or desktop, download the optional free Connect app for iPhone, Android, PC or Mac. 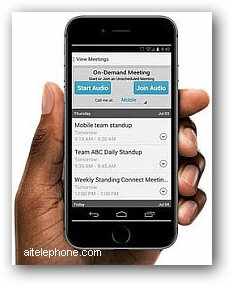 It makes hosting and participating in international conference calls easy with just a screen tap. No access numbers to dial or remember. Store your passcode safely in the Connect app. The Connect App and dial-out feature share the same global rates. Download the free Connect app using the link included with your account activation email. Most of the time your guests can dial-in normally using the included toll-free or local access number from their country. If required, you can dial-out to a participant and easily add them to your call. 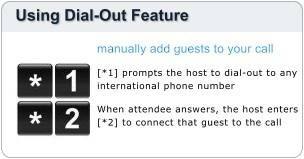 If you have a guest located in a remote country, for example, Papua New Guinea (no access number there), you would use the dial-out feature to add that guest into your conference call. The dial-out call is routed from your account through our international conferencing bridge and connects any attendee in any country without concerns about access number availability. Your overseas guest simply waits for your dial-out call to ring their phone and upon answering, they are instantly joined to your call. The Leader can manually dial-out to any phone number globally using a simple keypad command shown below or the 24 hour operator can perform the dial-out. To manually dial-out and add an attendee to a call, do this. This means per minute charges are all billed to the account owner, the participant does not pay to call a toll free number from their country or if they are dialed-out to, or if they use the Connect App. You can record your conference calls and download an MP3 audio file. Participants that wish to use Skype can access your conference call. The international conferencing bridge is Skype compatible. After each conference call, the moderator receives a system email automatically. This attendance report summarizes the conference call that took place including date, time, duration, caller ID, etc. If the call was recorded, a link to the MP3 file is included for immediate download. During a conference call, the moderator can instantly reach an operator using the phone's keypad with command [ 0 0 ] 24 hours a day. 24/7 operator support staff will attend to any issue.